A degree in Ayurved from a University established by law or a statutory Board/Faculty/Examining Body of Indian Medicine or its equivalent as recognized under Indian Medicine Central Council Act, 1970. A Post-graduate qualification in the subject/specialty concerned included in the schedule to Indian Medicine Central Council Act, 1970. Total teaching experience of ten years in concerned subject is necessary out of which there should be five years teaching experience as Reader/Associate Professor in concerned subject. The application form is available only on University's website i.e. www.raujodhpur.org from which the application form and conditions may be downloaded. A candidate must have enclosed a Demand Draft of Rs. 4000 for General and OBC candidate and of Rs. 2000 for SC/ST candidate along with downloaded application form in favour of Registrar, Rajasthan Ayurved University, Jodhpur payable at Jodhpur. Complete application form must reach by last date 29 July 2016 upto 5.00 P.M. in the office of Registrar, Rajasthan Ayurved University, Kadwad, Nagaur Road, Jodhpur (Rajasthan) by Personally/Registered Post/Speed Post. Incomplete/late received application forms shall not be accepted. No teaching experience is required. Lecturer will be treated as Asst. Professor. 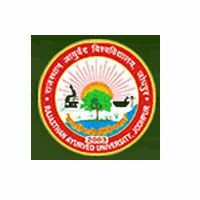 Dr. Sarvepalli Radhakrishnan Rajasthan Ayurved University recruits Professor, Associate Professor, Assistant Professor Posts. Candidates with Graduate, Post Graduate can apply. Dr. Sarvepalli Radhakrishnan Rajasthan Ayurved University, Jodhpur is the first Ayurved University of Rajasthan and is the second University of it’s kind in India, . The Dr. Sarvepalli Radhakrishnan Rajasthan Ayurved University was established by DSRRAU Act -2002 (Act No. 15 of 2002) which came into force w.e.f. may 24, 2003 vide Gazette Notification no. F25 (6) Ay. /2000 dated May 24,2003. This university has now affiliated all the 44 colleges/institutions of Ayurved, Unani, Homeopathy, and about 7000 students are pursuing their UG, PG, Diploma and Doctoral Studies. This university is conducting the admission to its degree courses through Joint Entrance Test at National level/ State level.